While we were in Philly (Philadelphia), we got to know about Atlantic city from one of my husband's colleagues. 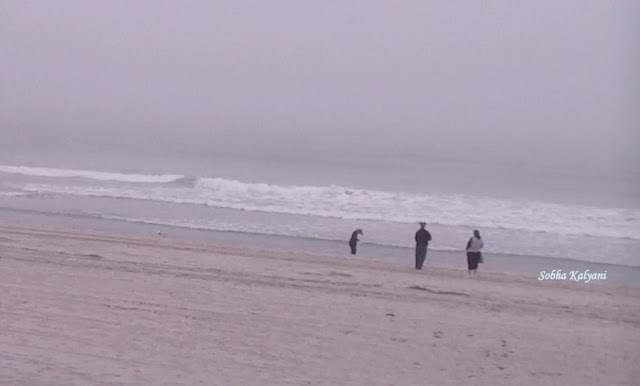 It was a couple of months before we moved from Philly, we planned a road trip to Atlantic city. It was in the 2nd week of March on or before / after St.Patrick's Day, we went on a road trip to Atlantic city from Philly. I feel it's not the right time for Indians in particular, to visit the place. I came to know that there are many play things for children but these were not operating as it was chill and foggy weather. I suppose these play things will open in summer. It was a sunny morning when we started from Philly and the drive which was around one and half hours, as always, was quite enjoyable. As always with clicks / shots all along the drive. Let's have some briefing about Atlantic city. 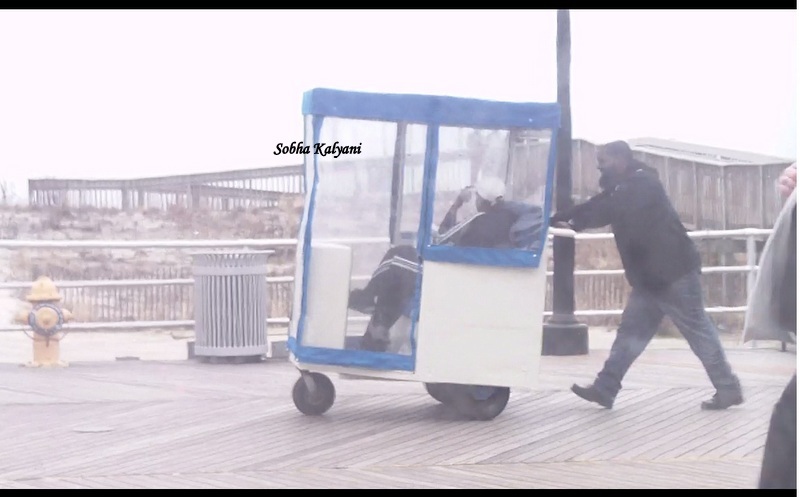 Thiscity is known as the best entertainment capital of New Jersey. It is a gaming and resort capital on the East coast along the sea side. As you enter the city, you will be dazzled to see rows of casino hotels. 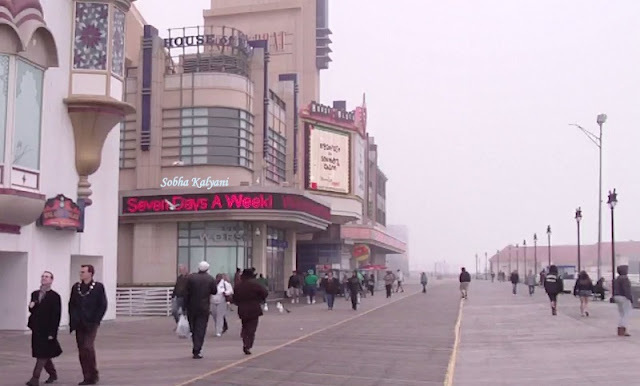 Atlantic city is one of the most popular tourist destinations of the U.S that attracts large tourists every year. Even Indians like to visit this place, enjoy the gaming experience and a walk on the historic boardwalk with a beautiful view of the Atlantic Ocean. 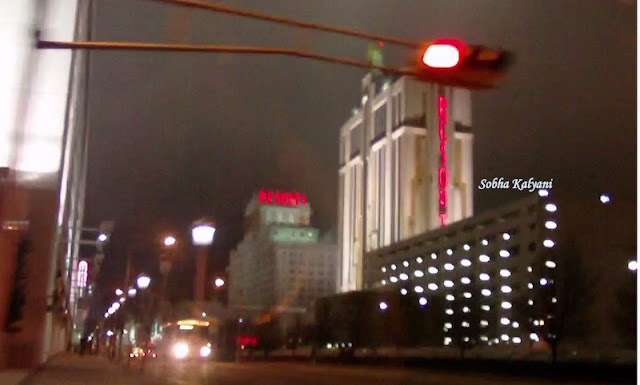 While driving on the road, we could see some of the popular casinos of the city like Caesars Atlantic City, Golden Nugget Hotel & Casino, Bally's Atlantic City and the Trump Taj Mahal. In addition to offering gaming entertainment in the casinos, most of these hotels offer luxurious spas, elite shopping inside and many more. Perhaps all the luxurious attractions on the shores of Atlantic ocean, made the place one of the most popular tourist destinations in the U.S. Besides luxurious casino hotels, there are many non-casino / non-gaming hotels too. Well, we parked our car at a convenient place and entered the boardwalk. This is a long stretch of walk way where you can see tourists walking all along enjoying the view of the sandy shores and the ocean. We found it difficult to walk along with our 2 years old daughter in the chill and foggy weather. So we took the unique / famous rolling chair which is pushed like a richshaw by the porter. The rolling chair is covered with transparent plastic sheets so that you can enjoy the view of the sea and also get protected from the chill breeze. As we moved along the walk way, we could see the pier and children's play zone which was closed due to off season. Unlike beaches in India, summer months of June / July would be the best time to visit Atlantic City. The beach and the boardwalk will not be heavily crowded as most of the visitors are engaged in gaming entertainments. After enjoying the ride, as always, I was attracted towards a gift shop. There are rows of gifts shops on the walk way and you can get many attractive items here. From here we spent some time strolling in the sandy beach and took few clicks of the Atlantic Ocean. As, I'm a native of Visakhapatnam in Andhra Pradesh, I find our own Vizag beaches much more beautiful. May be this is because of my love for my city. 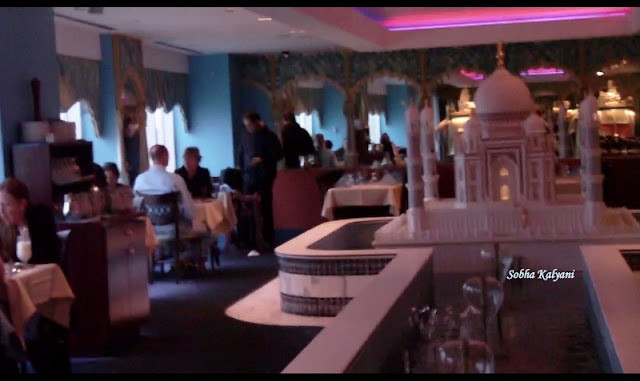 Anyway, after enjoying the beach stroll, we walked into Taj Mahal restaurant. The ambiance was good in the restaurant with the beautiful model Taj Mahal at the center. We had some typical Indian veggie but the taste was okay, just compromise. It was already evening and getting darker. My little daughter was damn tired by that time and was feeling sleepy. We drove back to Philly. I was awed to see the glittering streets of Atlantic City on our way back to Philly. The above pic is not clear as the weather was foggy and I took the snap from inside the car. Anyway that was a wonderful enjoyable road trip from Philly to Atlantic City and back to Philly. The moment we got into the car, my little daughter went to sleep. I personally feel that this is not a right place for Indian women (home-makers) to enjoy. We have more beautiful beaches in India. The only difference is cleanliness. If Indians maintain cleanliness of the beaches and beach resorts, ours would be far better to enjoy. I think Indian men might enjoy gaming in the casinos. Frankly speaking, being an Indian that too South Indian, I don't find this place much enjoyable. It's okay for visiting once.